We all know that buildings can be toxic to those who live and work in them and with luck, in this bad economy, can be fixed before more jobs are lost. Recently I read a client who suffers from Sick Building Syndrome, something I was totally not familiar with but turns out to be far more common than one could image. She first started experiencing symptoms at her work place, though it took a while before people believed she was actually sick. As time passed, other reported the same health problems, so now something has to be done as she leaves with workers comp by the end of the year. But not everyone can afford to live on a part-time salary. This year the incidents of Sick Building Syndrome (SBS) have gone through the roof due to the extensive flooding that has occurred around the world, promoting the growth of fungus, mold, and other biological toxins. As with all illnesses, on the soul level, they are usually a means to an end - disability - workers compensation - and whatever it takes to go from a lousy burnout job to seeking their greater purpose in life. Hopefully the course taken to that end is something is not too disabling. Most people in the world of metaphysics have a back story about something dreadful that happened to them which set them on a path of healing and recovery for self and others. It's about the organic side of life, exercise, diet, therapy, and healing the wounded soul by trying to maintain balance until our reality ends. And so the pattern continues until the end of humanity's journey here ... soon. It is all a consciousness hologram. 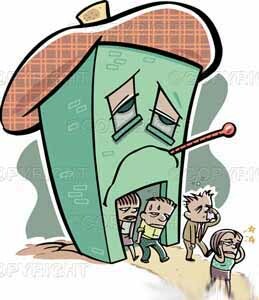 Sick building syndrome (SBS) is a combination of ailments (a syndrome) associated with an individual's place of work (office building) or residence. A 1984 World Health Organization report into the syndrome suggested up to 30% of new and remodeled buildings worldwide may be linked to symptoms of SBS. Most of the sick building syndrome is related to poor indoor air quality. Sick building causes are frequently pinned down to flaws in the heating, ventilation, and air conditioning (HVAC) systems. Other causes have been attributed to contaminants produced by outgassing of some types of building materials, volatile organic compounds (VOC), molds (see mold health issues), improper exhaust ventilation of ozone (byproduct of some office machinery), light industrial chemicals used within, or lack of adequate fresh-air intake/air filtration. Symptoms are often dealt with after-the-fact by boosting the overall turn-over rate of fresh air exchange with the outside air, but the new green building design goal should be able to avoid most of the SBS problem sources in the first place, minimize the ongoing use of VOC cleaning compounds, and eliminate conditions that encourage allergenic, potentially-deadly mold growth. The causes of Sick Building Syndrome can be attributed to inadequate ventilation, chemical contaminants from indoor or outdoor sources, as well as biological contaminants. Many volatile organic compounds, which are considered chemical contaminants, can cause acute effects on the occupants of a building. "Bacteria, molds, pollen, and viruses are types of biological contaminants," and can all cause SBS. The American Society of Heating, Refrigerating and Air-Conditioning Engineers (ASHRAE) recently revised its ventilation standard to provide a minimum of 15 cfm of outdoor air per person (20 cfm/person in office spaces). In addition, pollution from outdoors such as motor vehicle exhaust, can contribute to SBS. Building occupants complain of symptoms such as sensory irritation of the eyes, nose, throat; neurotoxic or general health problems; skin irritation; nonspecific hypersensitivity reactions; and odor and taste sensations. Several sick occupants may report individual symptoms which do not appear to be connected. The key to discovery is the increased incidence of illnesses in general with onset or exacerbation within a fairly close time frame - usually within a period of weeks. In most cases, SBS symptoms will be relieved soon after the occupants leave the particular room or zone. However, there can be lingering effects of various neurotoxins, which may not clear up when the occupant leaves the building. Particularly in sensitive individuals there can be long-term health effects. There might be a gender difference in reporting rates of sick building syndrome because women tend to report more symptoms than men. Along with this, there have been studies where they found that women have a more responsive immune system and are more prone to mucosal dryness and facial erythema. Ace equipment and materials (example: blueprint machines), whereas men may more often have jobs based outside of offices.